 Prevents fraudulent activities by adding additional features to the checks. 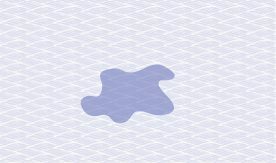 An artificial watermark is a subdued representation of a logo or word printed on paper. Artificial watermarks can be viewed while holding the document at a 45 degree angle. Copiers and scanners capture images at 90 degree angles and cannot read these marks. A hologram is a multicolored, three-dimensional image that appears in a reflective material when viewed at an angle. There are two holograms available, depending on the level of check ordered. An image or icon printed in thermochromic ink. Thermochromic inks react to changes in temperature. If you touch or blow on an image printed in this ink it will disappear. The image will reappear after it cools. Thermochromic ink’s reaction to temperature changes cannot be replicated on a color copier or laser printer. Warning Bands are printed messages that call attention to the security features that have been added to protect a document. Endorsement signature lines on the check backer are lines that are formed by printed words so small that they appear as a solid line or pattern to the naked eye. Under magnification the words appear. This level of detail cannot be replicated by most copiers or desktop scanners. Different spacing of diagonal lines used in the design of a check backer to deter altering by cut and paste method. A logo printed in an invisible fluorescent ink in a designated area on a negotiable document or check that can only be seen when viewed with a black light. Invisible fluorescent logos serve as a very useful tool to authenticate a document. 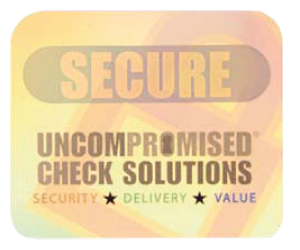 Uncompromised Check Solutions is authorized by the Check Payment Systems Association to illustrate their registered certification mark; the padlock icon. 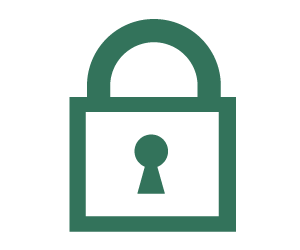 The padlock icon provides an indication to all parties accepting the checks that additional security features have been incorporated in at least one or more of either the design, the production process or the materials being used to produce the check. Uncompromised Checks that are printed on chemically reactive paper have a Chemical Wash Warning Box on the backer. The warning box calls the attention of the check verifier to the color of the check paper. Any discoloration within the box may indicate the check has been tampered with and should stop the verifier from processing the check. The security features are incorporated into the paper and are not printed. A True Fourdrinier Watermark is a faint design pressed into the paper while it is being manufactured. When held to the light, these watermarks are easily visible from either side of the paper. Copier or scanners are not capable of replicating True Fourdrinier Watermarks. Toner anchorage or adhesion is a chemical coating that fuses the toner to the sheet thus preventing the removal of toner with tape or by scraping. Invisible embedded fibers are ultraviolet, light-sensitive fibers in the paper stock and can be seen only under black light (ultraviolet light). Visible embedded fibers are fibers within the paper stock that can be seen with the naked eye. 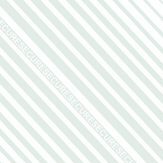 Paper that produces a stain or speckles when activated with ink eradicator-class chemicals, making it extremely difficult to chemically alter a document without detection.